iriver Spinn review | What Hi-Fi? The triumph of style over substance is a common phenomenon. From slick politicians (those memorably described by Ben Elton as “suits full of bugger all”) to architecturally stupendous footbridges that can't be walked across, form takes an increasingly important role compared to function. It shouldn't really be any surprise that products as modern and covetable as MP3 players should fall foul of this dark inversion. The iRiver Spinn (with two ‘n's, to indicate how stylish it is) values its looks over its performance as much as any player we've seen. The Spinn is a good-looking device. The big OLED screen is bright and detailed enough to do justice to any photos or videos you may wish to store, and the few obvious controls are discreet. It's well specified, too – there's FM radio reception, voice recording and support for several types of music file storage. 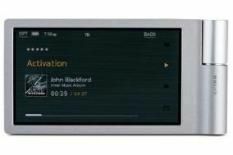 But, despite the fact that the Spinn's screen is touch sensitive, iRiver has pointlessly gilded the lily with the ‘Analog Wheel' at the top of the player's right-hand edge. This is a twisty control stick that clicks through the Spinn's (clear, concise) menus and controls. Thus you find yourself holding a player with two control interfaces, neither of which can be easily operated by just one hand. When it comes to its actual job – playing music – the Spinn is rather less full of itself. Santa Esmeralda's epic reworking of Don't Let Me Be Misunderstood is short of excitement, its hectic dancefloor emphasis underplayed by the iRiver's rather matter-of-fact presentation. There's a degree of spaciousness that eludes a lot of its rivals, but uncertain timing and a ponderous, plodding bottom end scupper the Spinn's chances of inducing any meaningful toe-tapping. For once, this isn't a player that can have its ills rectified by a change of 'phones – the white numbers supplied by iRiver aren't as bad as many we've tested, and Palace Brothers' There Is No One What Will Take Care of You sounds only a little more vigorous through our favourite Klipsch earbuds. £120 is a lot to pay for a 4GB MP3 player these days, even one as self-consciously stylish as this; for our cash we'd accept a bit less flash if it meant a bit more of what counts – sound quality.